THERE’S NO GOING back now. UK Prime Minister Theresa May will invoke Article 50 this afternoon, formally starting the Brexit process. The notification to leave the EU will trigger a two-year negotiating period with the bloc that will involve the hammering-out of thousands of issues, large and small. At the moment, almost everything is up in the air, and no one knows for sure what will come out of the talks. However, what are the main issues that could affect Irish businesses? We take a look. The UK is Ireland’s most important trading partner and being able to easily sell goods into the market is crucial for Irish businesses. The Financial Times has said that a zero-tariff arrangement covering goods could be agreed between the two sides in the negotiations if there are difficulties over trade deal negotiations (more on that later). Under this deal, both sides would agree not to raise tariffs until a final free-trade deal was completed. This could keep things broadly the same for the movement of goods, at least for the immediate future. Many Irish companies don’t just buy and sell goods, they also trade in services. Free trade was guaranteed when the UK was part of the EU and its customs union, but it is less clear what will happen now. Theresa May has said that she will push for “full access” for UK companies to the EU, but the single market is highly regulated and the rules for accessing it are complex. The EU has taken a hard line on services, and seems unlikely to leave the UK much wriggle room if it does not accept EU rules and supervisory agencies. 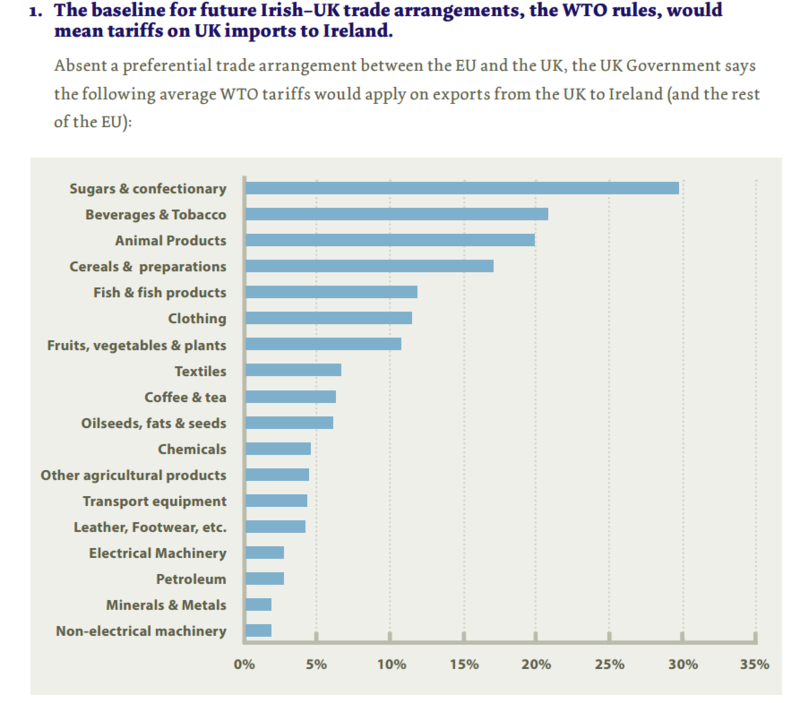 If a deal can’t be hammered out, the UK would fall back on World Trade Organisation (WTO) rules and tariffs. Here’s what some of these tariffs would look like. However, even the UK’s membership of the WTO is bundled with the EU’s. WTO director general Roberto Azevêdo helpfully summed things up in a speech delivered just before the UK’s vote to leave when he said: “The only certainty is uncertainty”. As an EU member, UK-based airlines can fly freely within EU airspace, something important to many Irish companies which have staff who do a large amount of travel to and from the UK. The Guardian reported last week that many airlines with large operations in the UK will probably have to relocate some of their business to the EU. Bloomberg recently quoted Lufthansa CEO Carsten Spohr as saying that there may be a “transition period with likely disruptions” as the industry grapples with Brexit. This morning, Ryanair weighed in, saying that the UK would need to strike a new deal with the EU to keep flights to Europe open or face disorder after March 2019. Longer term, it is possible that there could be restrictions, or at least more bureaucratic obstacles, for UK citizens to work in EU countries, and vice versa. Both Theresa May and Taoiseach Enda Kenny have said that they want no return to a hard border between Northern Ireland and the Republic, although it is unclear what will be introduced if the UK does end up leaving the customs union and common travel area. Sterling plunged in the aftermath of the Brexit vote, and is forecast to be relatively weak in the medium term. As a result, many Irish exporters, who will find it more expensive to sell their products into the UK, have been repeatedly urged to look at selling into other EU countries. However, plenty of businesses aren’t feeling the pain of the drop in sterling. According to a survey of its members by small business group ISME, just a quarter of respondents said more than 20% of their imports or purchases were sterling-denominated or from the UK. By contrast, just under half said that none of their exports or sales were sterling- denominated or to the UK.